The first piece is a neural network of childhood memories put through a phone's photo filters. The second one is a cable TV reimagining of first. The diptych tells a story of how images, once bright and full of life, can be turned unrecognisable and abstract by outside factors, be those the time or electronic devices' errors, or the brain's neurons. With time information obtains new meanings and gets alerted. Princess Diane, once a bright star for England, for Europe, and for the whole world, is becoming a digital memory, leaving behind nothing but weightless laces of beautiful thoughts. 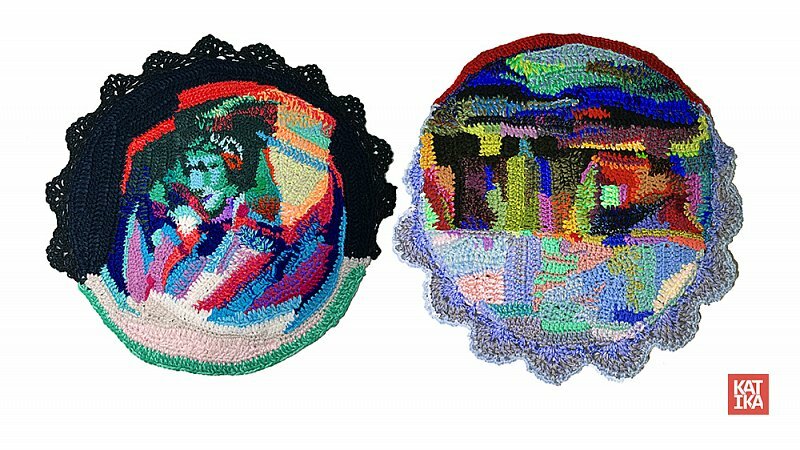 The idea of a neural network is visually represented by the crochet laced. Being a diptych in reality, Remembering Princess Diane also work as a triptych on the level of an idea, and it's third part the image of the princess in the eyes of the beholder, where the connections and bonds of memories disappear completely and can't be seen anymore.